Killer Characters: Decorating the Lighthouse! I bet you’ve been wondering what all the decorations and bunting mean on the cover of Eva Gate’s newest book, haven’t you? For those of you who haven’t read Reading Up A Storm yet (and why not, I might ask) let me explain. It was my idea and I’m so excited about it. With the municipal elections coming up (Go Team Connor!) I was in a meeting with representatives of other libraries and we got to talking about what we can do to remind people about the importance of getting out and voting. Women and minorities in particular, sometimes need to be reminded of just how hard-won their right to vote was. Other libraries are doing historical displays – posters calling for Votes for Women, or old campaign-literature and the like. But I had the brilliant idea of using the lighthouse itself! The lighthouse can been seen from miles away (that is kinda the point of it, isn’t it) so we’ll use it to remind everyone about the election, and voting. It’ll get everyone talking anyway. We’re going to decorate the entire outside of the lighthouse tower with ribbons and bunting and rosettes! It’s a big job, so we’ll make a big splash our of it. Do it on a Sunday afternoon, and invite the whole town to come out with kids and picnics. We’ll have games for kids, the firetruck will be there, and a job for everyone. It’s my job to draw up the plan. I think I’ll assign Connor to help Lucy attach the bunting to her apartment window. They need a good sharp nudge, the both of them. 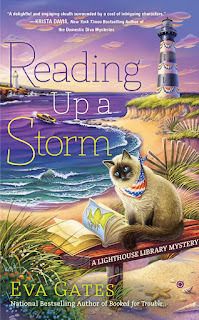 Reading Up A Storm, the third Lighthouse Library mystery by Eva Gates was released on April 5th. Eva is also Vicki Delany, author of the Year Round Christmas series from Berkley Prime Crime and the Constable Molly Smith series from Poisoned Pen Press. To find out what’s happening with Vicki and Eva’s books, you can follow them on Facebook at Vicki Delany and Eva Gates, or write to Vicki@vickidelany.com and sign up for their quarterly newsletter. This book was so wonderful! Charlene did a good job of getting Lucy and Connor decorating the lighthouse from Lucy's apartment! Thanks, Celia. I'm pleased that you liked the book.